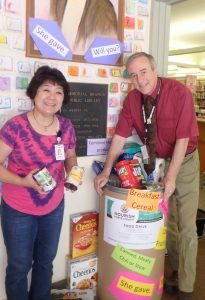 Generous Kobetich patrons donated food and toiletries until our collection bins over-flowed this summer! At 219 pounds Kobetich collected the most of any branch. All the donations went to the Pierce County Nourishopens a new window food bank to help our neighbors in need. Thanks NE Tacoma!